While moving into a new apartment, looking for a job and readjusting back to city life can be fun and exciting, it can be equally overwhelming and anxiety producing. 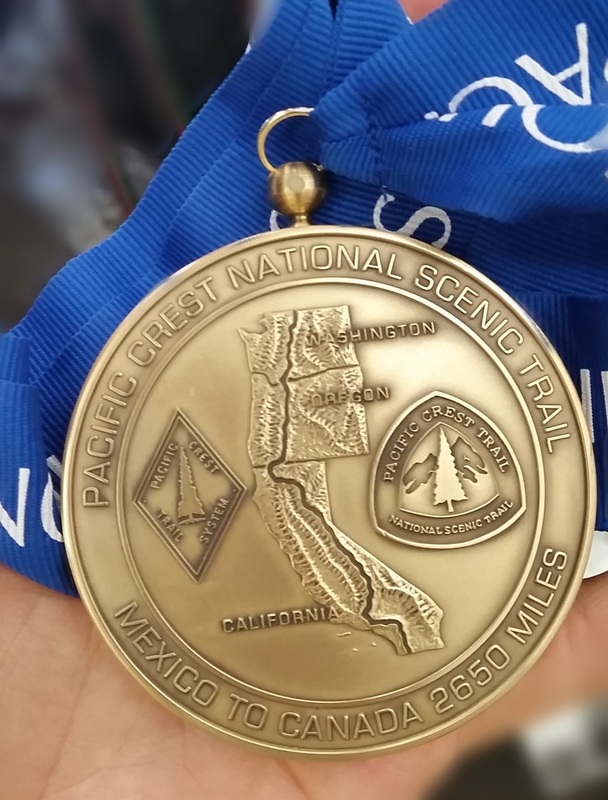 I wanted to share with y’all a picture of my PCT finisher’s medal! Receiving it helped me relive many memories from the trail, but it also made me realize that this adventure was really over. That saddened me, but every time I looked at this medal, I smiled. I chose to leave this token from the trail with parents in LA. It serves as a daily thank you for all of their help. My mom made the majority of our dinners and my dad shipped all of our boxes (adding cheese into each box before taking them to the Post Office ☺). 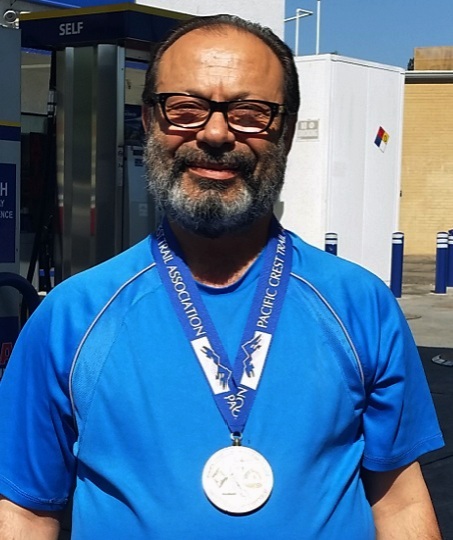 My dad proudly wore the medal and it brought me great joy to see him walking around with it, showing it to his neighbors and friends. It would be impossible for me to thank my parents for their help and the role they played in helping me realize an 8 year dream. I’m just grateful to have their support and love. And speaking of being grateful, my mom is grateful to all you – our readers. Thank you all for following our hikers. Your encouragement and support through comments was very important for them. As parents, we were very happy to know they had so many supporters and friends on their journey. When we would read your comments, we would feel very grateful and happy and teary eyed. ← Day 171 – all dots connected – PCT complete! Congratulations. You certainly have something to be proud of. What you accomplished out there is beyond amazing. I miss your almost daily missives and I hope you and Laurie will stay in touch. Ahhh, so sweet! Love your family was included in your adventure. Makes it even more special 💗 Your dad looks BEYOND happy! Pictures of your dad made me smile too! Thanks so much for stopping by our party. I can imagine the shock of re-entering civilization a little bit. I used to raft the Salt River in Arizona every spring — on the river for just four days – rushing water through a beautiful desert with barrel cactus on one side and saguaro on the other – but packing up on the river on the last day, driving to the airport and getting on the plane always felt a bit surreal. I much preferred being in the vehicle hauling the gear back to the Bay Area for a couple of days. Much easier to get back into the groove. Doing the airport route was too much. I wish you the best as you re–aclimate! Thank you so much Felicia! Your party was wonderful. We look forward to visiting again and exploring the mountains! I always wondered how you had so much fresh cheese for happy hour! You don’t know me (yet). I’m a high school friend of Laurie’s and have so enjoyed following your journey along the pct. congratulations and I hope to meet you soon when I catch up with Laurie in December. Good luck with the readjustment period back to city life. 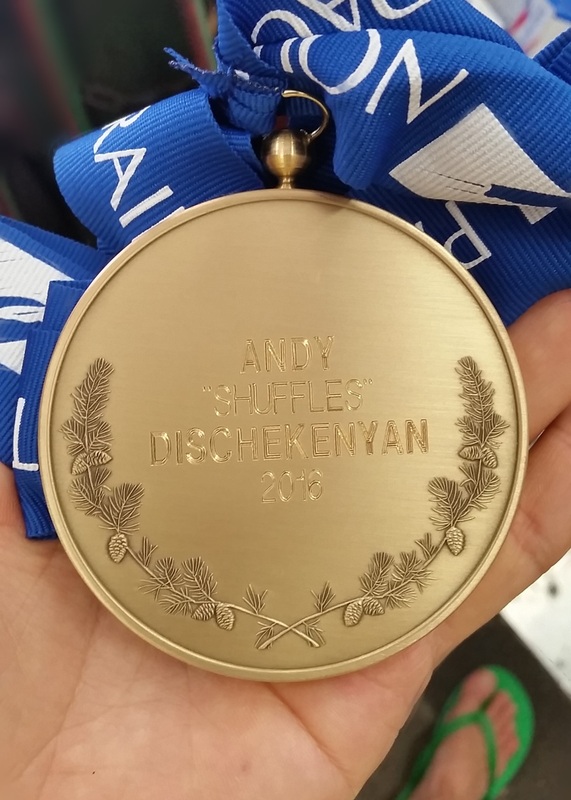 Congrats on your medal Andy and wondering if Laura received one as well? I might not be a thru hiker but at 52, my imagination can be that of a 5 year old in a good way. Reading thru your blog was as if I almost hiked this trail myself while I hike thru my everyday life. Very few blogs stand out as yours did and all I can say is Thank you. Your Dad sure looked pretty stoked to be wearing your medal. As far as paying our parents back, that’s an impossible task. What our parents went through raising us up to this point is priceless, all that we can do is carry on and honer them the best we can with the tools they instilled in us. And that’s all I can hope for from my two daughters, everything else is just icing on the cake. Speaking of cake, whens the wedding? Hoping you both keep up with this blog but totally understandable if you don’t. I’ve always been impressed by how hikers can keep up with a blog after hiking so many miles each and every day. This readjustment thing can be a tough thing to go through but I’m sure with your positive personalities, you’ll pull through and more then likely carry some of the trail with you in your daily lives. There’s a really good blog post from a 2014 sobo named “Doormouse” you might want to read. “Just Two Hiker”. They had a tough time after there hike and a major surgery to top it off but managed to pull through and she still puts out some really informative post. Give it a read if you get the chance. Please don’t read this one unless you want to hike again..
Best wishes to the both of you where ever the trail takes you. Thanks so much for your message Just Bruce! We really appreciate your support. While we won’t be keeping a daily blog post trail, we do plan to post a few more times – including reentry posts and food and gear reviews. And lastly, thanks for the links to Doormouse’s journal. We will surely have a read. Love!!! What a wonderful tribute to your family. Blessings. Such a cool and deserving metal! Tell your parents that just following you on this long journey I see that you are one good man. Laurie is a lucky woman! I have a big smile on my face. I’m very happy that Andy was able to express his gratitude and fill his parents heart with such a joy. Apri mer tghan. Wow, what an amazing adventure & achievement! I always wish them the best! Thank you for sharing their stories with me, I really enjoyed reading all their experiences and beautiful moments. Very sweet. Thank you for sharing!